"If" would be the important word in that sentence. If you dont give us Woken Matt prepare to be.....DELETED! There's also like 80 Chris Jericho's......so that argument is OBSOLETE! I think a promo star would be more than enough. Superstar card that states you can pack select Matt Hardy cards like his maneuver cards + 2 or 3 WOKEN cards. It would be MARVELOUS! Absolutely, would love to see the Broken Universe in card form. Senor Benjamin, prepare the battlefield... for ANNIHILATION! Yep would be great. Have the hardy compound be the venue of course. And ultimate deletion as a stip. I really wish jeff would bring willow and itch weed. My buddy did a fanatsy set where he could switch between his personalities. I’d much rather see superstars that are needing to be added into the game than another Hardy. We just had two in the last set. Give me Asuka, Samoa Joe, Alexa Bliss and Nakamura first please. Now that Ronda Rousey has officially joined WWE I want to see her being incorporated into the virtual RD, if not for the upcoming set then sometime this year. That would be too soon, we usually don't add anyone unless they've been around for a year. Too many 'flash in the pans' in the past. But yeah, she'd definitely be one worth having in Raw Deal down the road. 2- Samoa Joe...JOE! JOE! JOE! 12- #BROKEN/#WOKEN Matt Hardy...Ahhhhh-ahahah-ah-ah, ahhh! Rate my predictions ?/12 and let the speculations begin for the next release!? Otherwise, that's an impressive list of names! Damn! 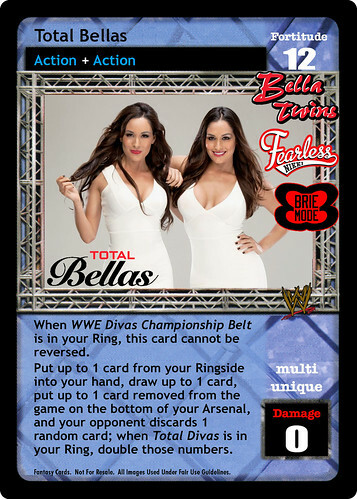 I thought the logo TOTAL BELLAS on that card was actually hinting their upcoming release! I was WRONG! Haha! Impressive, YES! YES! YES! Adds another meaningful year to my life.. Thanks TCO! Cheers! There's already multiple Bella Superstars, and they aren't even actively wrestling any longer. That's just the show logo, similar to the Holy Foley! show log on that card. Everyone else ,though, has definite Superstar potential! Out of these, I really hope to get Joe, Carmella, Ascension, Bo, Curtis and Emma soon. But of course, I do hope we get some surprises that haven't seen much teasing yet like Asuka and Nakamura but they can wait. Can't wait for December to arrive faster so we can get our holiday set fix for the year! Whoever it is, I'm sure we'll all be glad! Some will just be glad-er than others. Just wondering... if there is ever a new plan in the near (or far) future where there will be an expansion focusing more on deck building cards instead of superstars? something like new tech or like the classic line of cards from V4 to V8 thus far. Not really, to be honest. Making non-SS cards is really difficult with so many Superstars to exploit them. "Oh crap, we forgot Jamie Noble + X breaks the game!" or "New Day wins in 2 turns with this? Aw man, back to the drawing board"
There is an idea to make Cruiserweights stand out, but that's based around one (maybe two) cards, more on that down the road. I'll definitely mention a hard pass on one Superstar though, we won't be releasing Enzo Amore or Enzo & Cass, sorry. As a designer, it's sad because their set was fairly creative and fit the two characters, but it's just not something we're comfortable doing. That's okay, though, there are SO many new Superstars coming in that the loss won't be felt, and I suspect Cass will find his own way in time. Meanwhile, I'll confirm two very obvious and expected names: Finn Bálor and Shinsuke Nakamura. Female stable possibly? Doubt it could be the riot squad since they are fairly new but would be cool down the road. This would be interesting! Balor would be interesting and I can't wait to see what TCO will do with his gimmick! Oh damn i forgot about Emma, shame they let her go considering how talented she is. She’s another one that would be awesome to get. Part of me says we wont get her cause she was released a while ago but then again we got a new Punk so who knows. On a side note i think we can count out getting a Rich Swan set at this point as well. Yeah, Rich Swann is tricky, since there were a lot of allegations, and his wife is now denying a bunch of it. That's a toughie, as much as I want to see him in the game from meeting him at PWG a few years back. Ah well. In the meantime, I'll spoil this much... I had a plan to make a subset of NXT called Arrival, for those Superstars on that first card, either giving them a card or making that Superstar (except CJ Parker, cuz.. yeah. haha) So it's very likely you'll see some names that aren't in the WWE any longer, but hopefully they look and play well enough that people won't be too upset. That would give us these new Superstars. Nothing to be upset about with this roster, including 6 more new Superstars. Very fitting with some logos we saw in V8. While its always nice to get new superstars I think I we we would be fine if we never get a Mojo, Bo Dallas or Accession set. Tyler Breeze on the other hand is a must, but i would prefer to get a Fasion Police set instead. Sorry, we're not taking personal requests.